cameras ~ two year pilot evaluation"
We have some major concerns about highly misleading figures and conclusions in the DfT commissioned report of the two year pilot scheme for speed cameras. In fact we think it's entirely false. We were pleased to be offered a meeting with Professor Heydecker (one of the authors) and felt that we would like to establish some basic facts before the meeting. So we wrote the letter below. After one month we've had no reply whatsoever - not even an acknowledgement. However Susan Beck of "National Safety Camera Liaison" was well aware of our letter when questioned on the telephone. If we do get a reply we'll be sure to publish it to this page. It's about time we had a reply Professor. We sent a reminder on 5th September. See below. A reply arrived on Tuesday 9th September 2003. We're unsurprised to note that it is highly inadequate and we are preparing a further letter. We replied on 10th September 2003 with a very basic question. 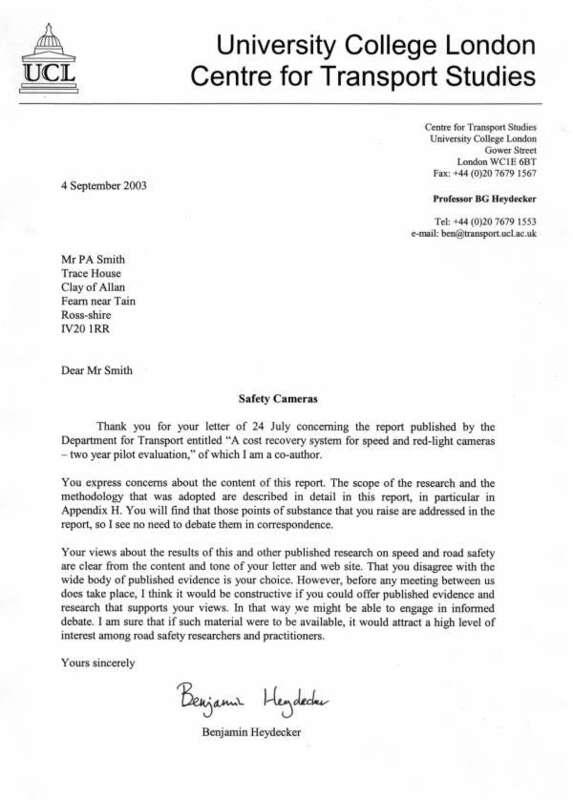 Further to correspondence between Simon Tonks and Susan Beck I have been asked to write to you and I have been assured that you will be able to answer questions in some detail about the government document: “A cost recovery system for speed and red-light cameras ~ two year pilot evaluation”. Why are there no fatality figures? I quite understand that the numbers may be too small in some cases for statistical significance, but county-wide, and pilot-area-wide figures would have been useful and would have revealed some serious anomalies. We could not obtain data for the before period for individual sites other than at camera sites. It was therefore not possible to check fully for regression to the mean at the site level. The results for areas that bid unsuccessfully for participation in the pilot could be used as a comparison for what might have occurred in participating areas if they had not been treated. The PIA and KSI frequencies for these areas do not differ significantly from other similar areas that did not bid for pilot status at all. On this basis, there is no evidence in the present data for any substantial illusory benefit due to the regression to the mean effect. Those are weasel words. I expect having insufficient data to check for regression to the mean benefit illusions was a considerable relief to those who wished the report to show a benefit. How much of the claimed headline benefit is due to traffic reduction? I can find no mention in the report of reduced traffic volumes at camera sites. Since it is well know that drivers prefer to drive on routes where there are no cameras I find this quite astonishing. In cases where suitable alternative routes are available installation of cameras can lead to quite substantial reductions in traffic. Naturally with reduced traffic on a given route we would expect there to be fewer accidents. I wonder if you noticed that the pilot areas taken as a whole showed untypically bad performance in 1999, compared to the rest of the UK? (Especially for fatal accidents.) This has tended to incorporate a wide-area regression to the mean benefit illusion that has not be compensated for. What are the ranges of sizes of the “camera sites” considered? Are the cameras really responsible for reductions in accidents at the most distant extremes of the sites? Compensation for traffic volume reduction is important here. How much of the benefit claimed for cameras is due to other safety treatments? It is very common for a speed camera to be added to a road at the same time as other safety treatments. No mention is made in your report of other safety treatments applied at the same time as the cameras. This must be causing an error in your headline figures of unknown size. It could be very substantial. It is entirely unreasonable to assign the entire benefit to the cameras, but that is exactly what you have done. Your report falls very far short of adequately considering the extent and the implications of casualty displacement. If you look at the trial counties over say 15 years and taken as a whole, which years show the greatest improvements? Were they the years of the hypothecation pilot? (I can tell you they were not.) This alone is a very strong warning that “things other than cameras” are better for road safety. What do you believe to be the benefit of reduced speeds at camera sites? The report makes much of the reduction in speeds at speed camera sites. A linkage is made to TRL421 and the claim of a 5% reduction in accidents for each 1 mph reduction in speed is repeated. But I expect you know TRL421 is not justified in making its claim. No evidence is offered that the reported speed accident relationship has a causal link. Do you have any substantial evidence that a reduction in speeds due to enforcement causes a reduction in accidents? References please! Obviously there are negative economic effects of reduced speeds. Time, after all, is money. It is a great shame that these economic effects were not considered. I may have some further questions depending on how we got on with these. I look forward to hearing from you in due course. I wrote to you on 24th July and have yet to receive any reply. I attach a copy of the letter for your reference. If you require further time, perhaps you would be good enough to indicate how much longer I might be expected to wait. The issues raised in my last letter are literally a matter of life and death. I shall not rest until I have satisfactory answers. I apologise for misspelling your name in my last letter. Thank you for your letter dated 4th September. I note that you have not answered any of my concerns. Before we go any further, I must just clear up one point. Do you actually deny that an uncompensated site level regression-to-the-mean benefit illusion exists within the “35% reduction at speed camera sites” headline claim of your report?